Eight Mukhi is ideal for removing obstacles and creating stability of mind. Rudraksha is not an ornament which can be used as one likes. Rudraksh is a holy bead and requires proper handling. One has to follow wearing rules, in order to feel its power. 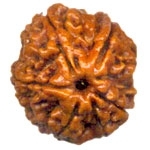 Rudraksha is a holy fruit which is worshiped before and after it is used. Each type of Rudraksha is treated with religious rites on an auspicious day before it is used. It is respected and honored in order to get the same honor and respect from it. A wearer is said to establish a one to one relationship with the holy bead and one should respect this relationship.